An Orthodox Priest, a Catholic Priest and a Rabbi are talking about how they divide up the collection money from their congregations. "To divide up the money," said the Catholic priest, "we draw two circles on the ground: one small one inside one big one. 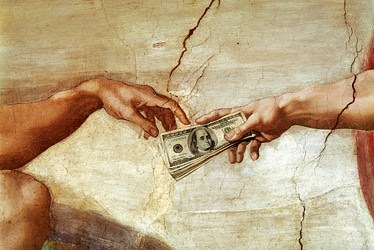 We then throw the money up in the air, and whatever lands in the big circle we give to use for the church, and whatever lands in the small circle we keep for ourselves." The Orthodox priest nodded. "Yes, we do the same, except that whatever lands in the small circle we give to God, and whatever is in the big circle we keep to ourselves." "Nu," said the Rabbi, "we also draw two circles on the ground, but we throw the money up in the air, and whatever God wants, he takes!"